In Chicago and its suburbs, about 15 people are killed and 3,000 injured every year while riding a bike. Last night I joined more than 100 cyclists in Chicago, and thousands more around the world, for the annual Ride of Silence. The ride honors the victims of cycling fatalities as well as their families. In Chicago Ride of Silence volunteers coordinate the placement of the white “Ghost Bikes” to honor the victims. As in years past, the route took us to a number of ghost bikes where we shared a silent moment of respect and reflection with family and friends of the victims. I am truly amazed at the strength families have shown in the midst of this deep sadness, and the positive changes they have helped create. 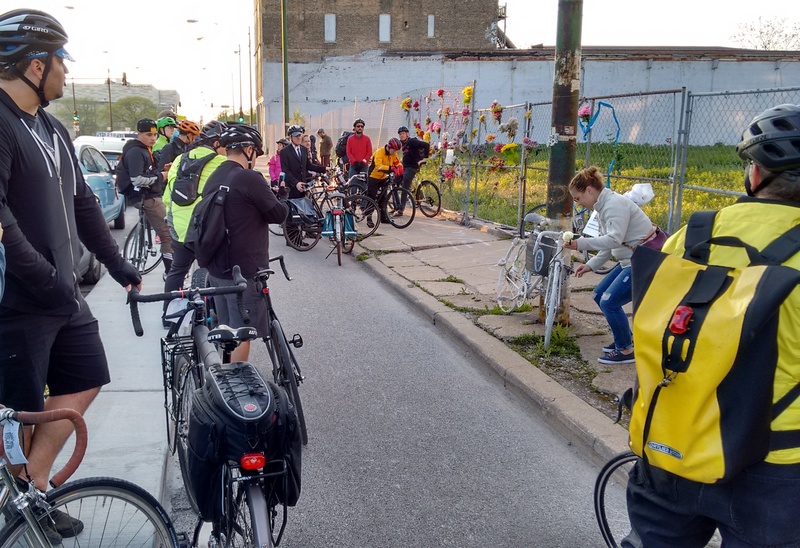 It was a poignant moment when all 100+ of us rode with the friends and family of Bobby Cann to his ghost bike within anew curb-separate bike lane on Clybourn. These bike lanes would not have happened without the advocacy of Bobby’s family and friends. We finished at the newest ghost bike near N. Lincoln Ave. and W. Addison St., honoring Joseph Korner, who was an active, healthy 78-year-old former Whitney Young High School teacher and regular bike commuter. His wife Lindy joined us to read some of Tom’s writings about the importance of living life to its fullest. In his honor, Lindy is exploring ways she can help improve bike safety in Chicago. More than anything else, I think the Ride of Silence strengthens our resolve to eliminate traffic fatalities and serious injuries. No more ghost bikes. No more pedestrians mowed down in cross walks. This is the goal of Vision Zero — to eliminate traffic fatalities entirely and to substantially reduce serious injuries. We have a long ways to go, given that more than 1 person is killed and 100+ are injured daily in Chicago-area traffic crashes. But the Vision Zero goal reminds us not to accept these tragic deaths. With the right strategies, the goal can be achieved. About 80 percent of the traffic fatalities and injuries in Metro Chicago are people in cars, and only a small percentage of those incidents happen on highways. The battle for Vision Zero will largely be won on local streets. Complete Streets that are safe and accommodating for people on bikes and foot are safer for people in cars as well. Active Trans is campaigning for more progress on Vision Zero across the region. In 2015, we worked with physicians, traffic safety experts and victims of traffic crashes to support the city’s goal and advocate for leaders to devote more resources to it. Earlier this year, Chicago joined the national Vision Zero Network of cities working on Vision Zero in the U.S. In joining the network, the city committed to developing a Vision Zero task force and action plan — two critical aspects to hold leaders accountable and ensure progress. Sign our Vision Zero peition to Chicagoland officials to show your support. Kudos to Elizabeth Adamcyzk, who runs the Chicago Ride of Silence and organized last night’s event with help from a group of outstanding volunteers. Check out her recent blog post about the event.